Fully portable ramp system makes it easy to set up and take down. Whether you're in one place or on the go. Ramps roll up for storage or transporting; they are easy to set up; available with removable handrails and platforms. Platform Brackets are pre-attached at the factory before being shipped so just insert the ramp approach plate, platform legs and handrails. 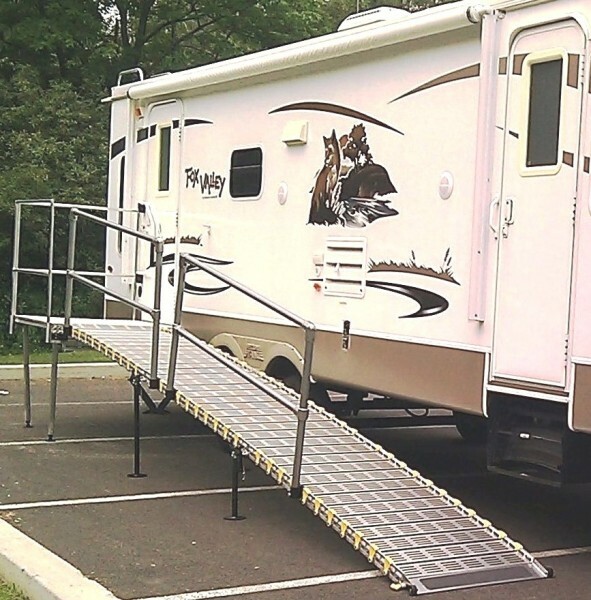 Roll-A-Ramp has been a hit with our customers who own a travel trailer, RV or other mobile camping vehicles. The reason? There is nothing else like it! The system sets up and takes down quickly. It can also be stored right inside the trailer.